When it comes to instant food prep or whipping up a quick solo smoothie or soup, you don’t necessarily want to be dragging out a huge tabletop blender. Instead, reach for a hand blender. The BEST hand blender. A hand (or stick) blender is comprised of a hand-grip and a removable dishwasher-safe shaft that houses a fast spinning star blade specifically designed for mushing stuff up. Our first choice is the uncompromisingly monikered Bosch MSM88160GB, although all of these five are really excellent efforts. Kenwood’s kMix HDX754 offers a more stylish take, while the prosumer option comes, as usual, from KitchenAid. Get your digits round one of these and you’ll be whipping, chopping and dicing till the cows come home. And then you can blend them, too. The key uses for hand blenders are whipping up the odd single-serve smoothie and reducing stewed fish veg and meat to soup. Hand blenders are also exceedingly useful for the preparation of small amounts of ingredients. Whether it’s making hummus, guacamole, salsa, sauces, mayonnaise, whipping cream, egg whites or pancake mixes or chopping nuts and pulverising ice, these hand-held appliances are a chef’s best friend. Unlike their worktop counterparts, they can be used to mix and stir ingredients in a saucepan while it’s on the hob. As with most appliances, you get what you pay for but even the cheapest hand blender will be able to tackle the majority of tasks. However, if you plan on mashing dense ingredients like avocados and peanuts or crushing ice then go for a model with some decent wattage. The most expensive models are equipped with 700-800 watt motors and will deal with pretty much any type of ingredient. But if you only plan on making soft pastes, sauces and meringue then perhaps go for something cheaper. All of these come with little, self-contained mini-blenders as well as the more traditional stick blender used in commercial kitchens the world over. Most of them also have a whisk, which can be invaluable for whipping cream and making meringues, helping your wrist survive for decades longer than it would otherwise. One final tip: hand blenders have a hard life, and hence a tendency to burn out suddenly. Keep your receipt handy with cheaper models and consider an extended warranty on pricier ones. I had a Bosch blender that lasted well over 10 years, and handled everything a hand blender could reasonably expect to be asked to do during that time. This latter-day replacement has a powerful, 12-speed, 800-watt motor and is a similarly superbly designed little workhorse. It feels substantially well built and is a doddle to use. In fact it could be the only food prep gadget you’ll ever need since it’s capable of handling a wide range of tasks including the making of much hummus, guacamole and salsa, whipping cream, chopping nuts, herbs and ice, blending smoothies and blitzing soups and sauces directly on the hob. This particular model features Bosch’s innovative QuattroBlade Pro. At first glance, it looks much like most other blender blades but closer inspection highlights a pitted golf ball-like surface with raised partitions. These partitions are said to guide the ingredients into the path of the blade to ensure even consistency without too much downward suction (a common anomaly with hand blenders). What jobs the QuattroBlade Pro can’t handle on its own are covered by the included chopping container with integral blade, a measuring beaker – good for rustling up a quick single-portion smoothie – and a small whisk for those emergency cream-whipping and meringue-frothing occasions when a stand mixer is simply too much of a pain to set up. If you’ve had enough of finely chopping ingredients by hand, one these souped-up grub busters will be your new best kitchen buddy. This hand blender was demonstrated to us a few years back by no less an expert than Monica Galetti off of Masterchef. And she's quite a demanding lady, even if Dualit were paying her a load of dosh to do so. Although this 700-watt silver bullet feels quite heavy in the hand, it’s immensely powerful, superbly balanced and thoughtfully designed with two easy-to-press speed buttons and a bit of overhang that pivots gently from the web between the thumb and index finger. It’s comprised of a star blade with a plastic base to protect pans and comes with a decent assortment of attachments – a balloon whisk for whipping cream, a handy prep bowl with integral blade for chopping nuts, making hummus and salsa etc, and a one-litre measuring jug. The main power unit’s patented anti-suction system is a useful design flourish as it prevents the blade housing from gripping the base of the pan or bowl, allowing it to be moved around with ease. However, the real star of the show is the chopping bowl. It rustles up a lusciously smooth hummus in seconds, and that’s good enough for me. 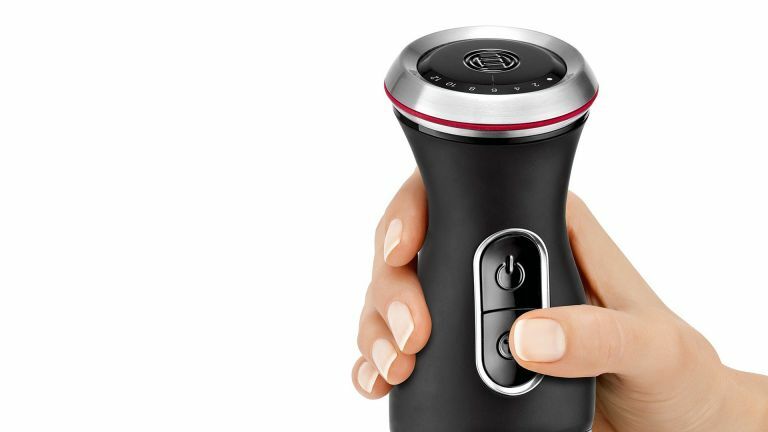 As a function of running off a rechargeable battery, this is only rated at 180 Watts but rest assured this pro-style hand blender does not want for blendability. The fact it's cordless means you can just whip it out of the drawer and blend anywhere that takes your fancy. Of course, you’ll need to have it charged first or the whole concept of cordless falls flat on its face. Luckily this five-speed model goes for up to 10 hours on a full charge and has a clear LED indictor displaying the level of charge left. It also holds its charge very well when left in the back of the cupboard for months on end. However, there is one caveat with this model that needs to be pointed out – it’s a big old horse dong of a blender, and not one for those with Donald Trump-sized hands. It comes with two blender arms, but even with the shorter one, it's a seriously lengthy proposition overall. The KitchenAid comes in a clear plastic storage case with three blade attachments – an S blade for blending, a star blade for mincing and a whisk for batters, emulsions, that kind of thing. It also includes a one-litre pitcher with splash guard and a chopping bowl with integral blade for preparing mushy stuff like hummus and guacamole. This is a great, cable-free choice, even if it is a touch on the premium side. This classy portable pulveriser is no better at mixing than the cheaper Bosch, but it is considerably more attractive. The 700W kMix has a variable five-speed thumb wheel that lets you start slow and easy so you don’t end up with a face full of egg yolk. The pulse function is handy for coaxing disorderly ingredients into the path of its blade. Kenwood’s latest TriBlade technology does the job of chopping, mixing and stirring with ample confidence. When it comes to larger dishes you always have the option of clipping on the XL foot which has a much larger surface area. Additional attachments include a half-litre chopping vessel and, for mashed potato fiends fed up with manual mashing, a MasherPro fitting that makes making mash much more manageable. Curiously, however, there is no whisk. This budget-priced, 400W model is equipped for a range of mild preparation tasks and features a standard star-blade whizzer, a balloon whisk, a small chopping vessel for herbs and nuts and solo-shot smoothie beaker. For something so cheap, this hand blitzer isn’t too shabby. It’s comfy in the hand, easy to use and powerful enough for all but the most intensive tasks. However, beware the star blade unit’s sharp metal base because it will almost certainly scratch your Teflon coated saucepans if used without a lot of care.